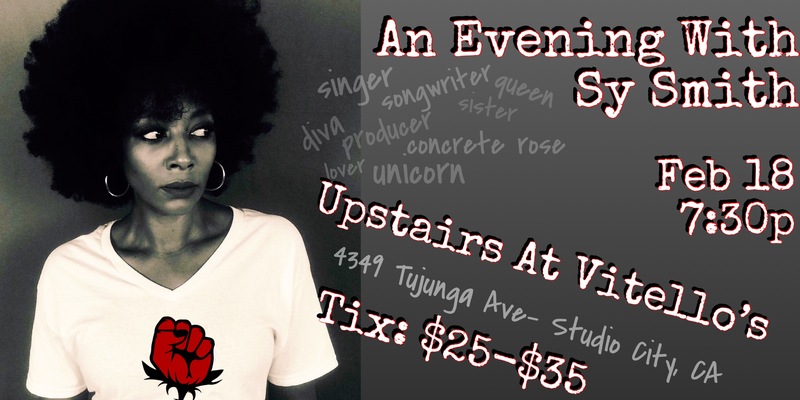 This Emmy-nominated singer/songwriter has been dubbed by her peers as the “queen of underground soul”. Sy Smith is considered one of the leaders of the indie soul movement (having released 5 CDs/3 EPs/1 DVD), plus she’s recorded and/or toured with some of the biggest names in R&B, hip-hop and jazz (Whitney Houston, Meshell Ndegeocello, The Foreign Exchange, Sheila E. and Pete Escovedo to name a few). Since 2015, she’s performed tributes to Ella Fitzgerald at Carnegie Hall, The Kennedy Center, Toronto’s Massey Hall and more. In 2018 she released her long-awaited 5th studio project – “Sometimes A Rose Will Grow In Concrete” – which she wrote & produced entirely herself, gaining 3 nominations from SoulTracks.com and earning placements in several music bloggers’ Best Of 2018 lists. Sy also co-wrote and was featured on Chris Dave & The Drumhedz’ 2019 Grammy-nominated self-titled album. She currently tours with Grammy-winning trumpeter Chris Botti and is featured prominently in his 2018 PBS special “Great Performances” wowing audiences with her range (which effortlessly goes from whimsical/romantic mezzo-soprano, to a soul-stirring whistle-tone). Sy is excited to return to Los Angeles for a long-overdue (and very rare, local) solo performance!